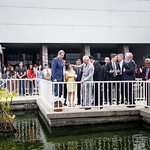 His Royal Highness the Prince of Wales today paid a visit to the Penang Headquarters of WorldFish. 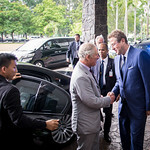 The Prince attending together with Victoria Treadell, British High Commissioner to Malaysia and Justin Mundy, Director, International Sustainability Unit, Prince Charles Charities took the opportunity to discuss with WorldFish leadership and Fisheries Malaysia the fragility of ocean ecosystems and the vulnerabilities of the communities that engage with them. The meeting was also attended Dato’ Hj. Mohd Rashid b. Hasnon, Deputy Chief Minister of Penang, the Honorable Dato’ Sri Devamany A/L Krishnasamy, Minister-in-Attendance and Bhg. Dato’ Haji Munir bin Haji Mohd Nawi, Director General of Fisheries Malaysia and newly appointed Member of the WorldFish Board of Trustees. At the recent Our Oceans Conference in Malta the Prince articulated threats to the marine environment and its crucial role as a source of prosperity, livelihoods and food security for many regions, countries and communities. The meeting acknowledged that this human element to international discourse on oceans is often missing. WorldFish Director General Designate, Gareth Johnstone also highlighted fish as a powerful means to affect nutrition security where deficiencies of micronutrients and essential fatty acids are widespread among people who obtain most of their energy from staple foods such as wheat, maize and rice. The Director General of Fisheries Malaysia, YBhg Dato’ Hj Munir bin Hj Mohd Nawi shared his views on the importance of ensuring sustainable management, utilization and conservation of fisheries resources for future generations. He also underscored the need for concerted regional and international actions to combat Illegal, unreported and unregulated (IUU) fishing as well as the opportunity to harness on the power of technology to help resolving the problem. 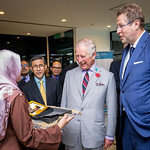 On arrival at the WorldFish headquarters the Prince was shown a small selection of photography highlighting WorldFish work on small scale fisheries as well as research collaboration between WorldFish and Fisheries Malaysia. The half hour meeting was followed by a photo opportunity with WorldFish staff. 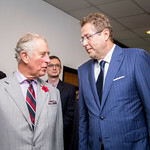 The visit was undertaken as part of the Prince of Wales and The Duchess of Cornwall’s Autumn Tour taking in visits to Singapore, Malaysia and India. Pursuing a research agenda through a network of multistakeholder partners, The CGIAR Research Program on Fish Agri-Food Systems (FISH) enhances the contributions of fisheries and aquaculture to reducing poverty and improving food security and nutrition. FISH brings together a unique set of multi-stakeholder partnerships to harness emerging science in aquaculture and fisheries to deliver development outcomes at scale. FISH is led by WorldFish, together with the Australian Research Council Centre of Excellence in Coral Reef Studies at James Cook University, Australia; the International Water Management Institute ; Natural Resources Institute at the University of Greenwich (NRI), England and Wageningen University, Netherlands . In regional contexts, the program partners closely with governments, NGOs, the private sector and research organizations to influence national, regional and global policy and development practice.